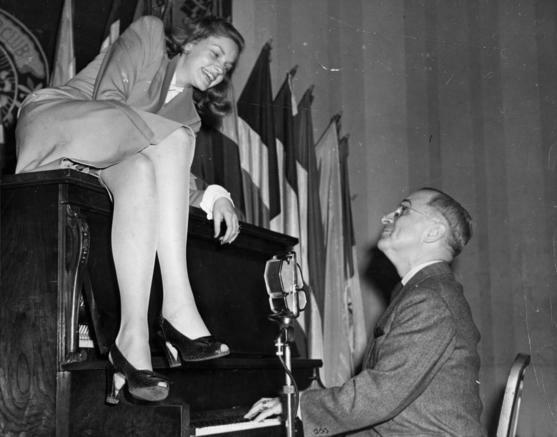 Lauren Bacall with Vice President Harry Truman. 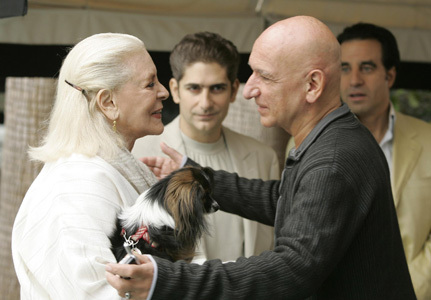 NEW YORK – It has been a rough week for Tinseltown, as one of the other shining stars died today. Lauren Bacall was a movie legend at 89 years old, who died of a stroke today at her home in New York. 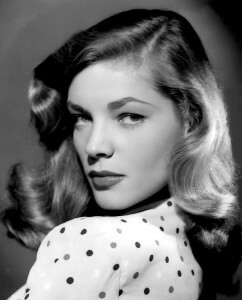 Portrait of a young and sultry Lauren Bacall. Lauren Bacall in an RC Cola ad. Born Betty Joan Perske in 1924 in the Bronx, she was a theater usher, fashion model, and student at the American Academy of Dramatic Arts. Known as Betty Bacall (her mother’s maiden name was Weinstein-Bacal, which she legally changed to “Bacall”), she made her theater debut at age 17. It was film director Howard Hawks’ wife who spotted Bacall in Vogue magazine, and insisted her husband give her a screen test. Instead, Hawks’ secretary sent her a ticket to audition…and then she signed for a contract with Warner Brothers, with Hawks changing her first name to Lauren. She starred in To Have and Have Not, with Humphrey Bogart. Though Bogart was married, he and Bacall started a relationship, and they were married two years later. She became known for her sultry voice and “The Look,” which was the downward point of her face, along with her upward glance. 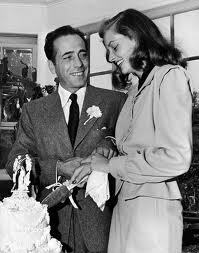 Lauren Bacall marrying the love of her life, Humphrey Bogart. Her love with Bogart or “Bogie” as he has been known, elicited films together including: The Big Sleep, The Dark Passage, and Key Largo. The two had an age gap of 25 years, yet their love endured…Bogart was diagnosed with cancer and passed away in 1957, with Bacall a 32-year-old widow. Some of her other famous films included: Young Man with a Horn, Blood Alley, The Designing Women, and How to Marry a Millionaire with Marilyn Monroe and Betty Grable.Murder on the Orient Express, Harper, The Shootist, The Mirror Has Two Faces. 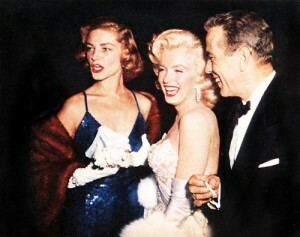 Bacall and Bogie flank Marilyn Monroe. Bogie and Bacall had two children, Stephen, and daughter Leslie. 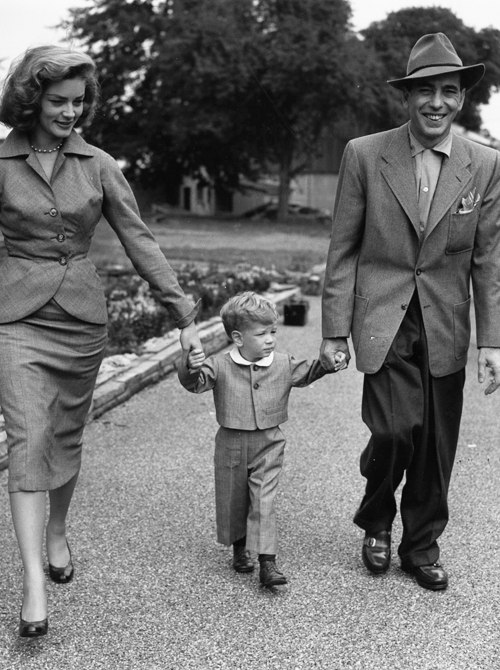 Bacall and Bogie with their son, Stephen. 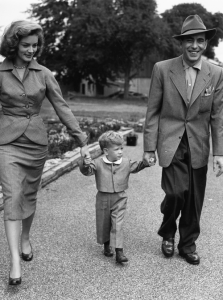 Leslie, Stephen, Bacall and Bogie. 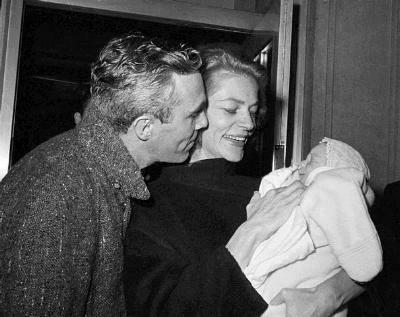 Bacall also married actor Jason Robards in 1961…a marriage that ended in divorce, but not before their son Sam was born. She also shared a brief romance with Frank Sinatra in between Bogie’s death and her marriage to Robards. 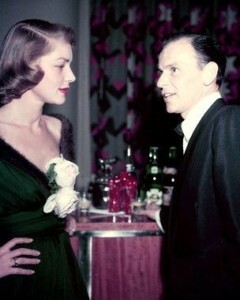 Lauren Bacall and Frank Sinatra. She was an award winning actress who received an Honorary Academy Award, as well as a Golden Globe (for The Mirror Has Two Faces), Kennedy Center Honors, American Film Institute recognition as one of the 25 most significant female movie stars in the history of film, and the Katherine Hepburn Medal. Other awards: Tony for Best Leading Actress, Bette Davis Medal of Honor, Screen Actors Guild Award, San Diego Film Critics Society Award, and many more. She has had some guest spots as well on shows like The Sopranos and Family Guy. Lauren Bacall during her role on the Sopranos. She was a celebrity spokesperson for Fancy Feast Cat Food, High Point Coffee, and Tuesday Morning. 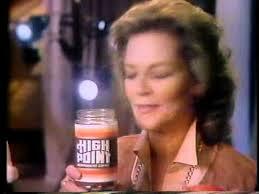 A screenshot from a High Point coffee commercial with Lauren Bacall. Israeli statesman Shimon Peres is her first cousin. Bacall would have celebrated her 90th birthday on September 16. Here is lovely Bacall in To Have and Have Not…it’s easy to see how smitten Bogie was with her…it was not just a role he was playing. Editor’s Note: We here at InsideScene.LA are saddened by Lauren Bacall’s passing. As Marilyn Monroe’s relatives, we know she was a true friend to our cousin. Please stay on the scene with InsideScene.LA as we continue to follow this developing story, and click here to follow us on Facebook.